Throughout his career, Delius maintained a strong attachment to the mountain ranges of Norway due to his friendship with Edvard Grieg. His desire to express in music images of their grandeur and beauty is evident in his earliest surviving work, the song “Over the Mountains High” (1885). His attraction to Norwegian scenery and the cultural life of the country was at its greatest intensity during the decade from 1888 to 1898. To these years belong Delius’s three early large-scale mountain-scapes: the melodrama Paa Vidderne (1888), a symphonic poem with the same name (1890–92), and the “fantasy overture” Over the Hills and Far Away (1895–97). His last mountain-themed work was The Song of the High Hills (1911) for mixed chorus and large orchestra. The chorus in this work sings no words; pure vocalization is employed as a means of poetic evocation. In the original score he gives the direction, “The chorus must be sung on the vowel which will produce the richest tone possible.” 2 Occasionally, a solo tenor voice seems to detach itself from the tonal fabric as a whole, but imperceptibly it disappears once more into the disembodied sound from whence it came. The Song of the High Hills has the most individual form of any textless work by Delius. It is ternary in outline, with an expansive interlude in the first section that foreshadows the intense contemplation of the central portion of the work. There is a strongly marked point of recapitulation and more obvious repetition of material. Two principal elements constitute the structure: opening and closing sections of forceful, striving material, and a central sequence of serene episodes based on a lovely, Grieg-like melody. 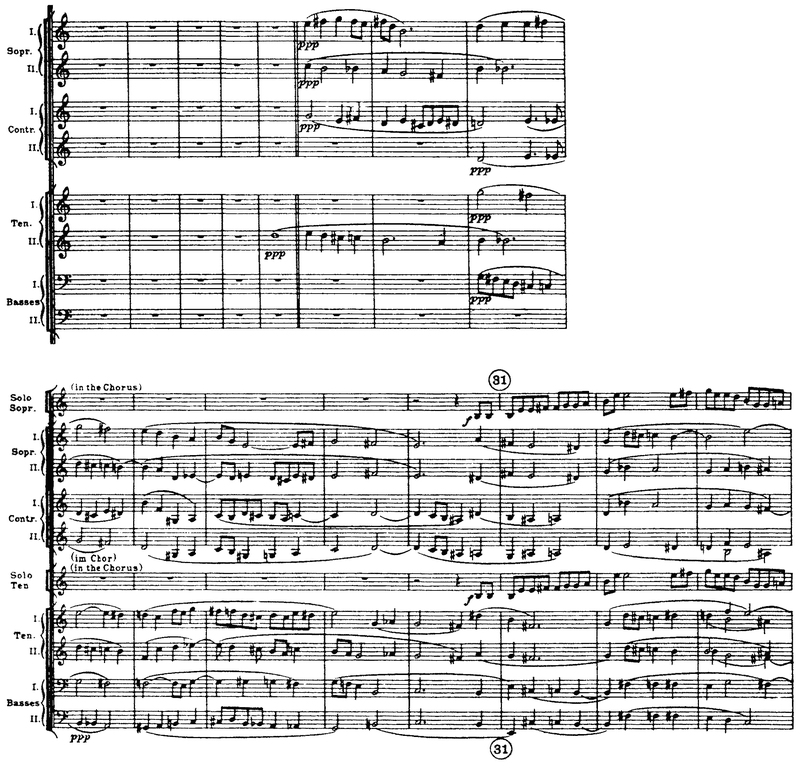 This motive later appears in the full chorus, followed by an echo of the original melody in the first sopranos. A wordless solo tenor in the chorus then presents the main theme. The full chorus then presents the theme in an a capella harmonization. At measure 288, solo soprano and tenor sing the ascending phrase from the tenor’s earlier entry as counterpoint to the main theme. The chorus proceeds unaccompanied for seventeen measures before the orchestra joins them, leading to a tremendous crescendo and climax. The voices steadily fade away to pppp. The orchestra builds to one last dynamic outburst, marked “With Exultation. not hurried” [sic] in the score before dying away in the strings, like the chorus before. The review of the premiere by Alfred Kalisch points out for special recognition the a capella section referenced above. In all three cases, however, the author fails to connect this work to others in the same vein, such as Holst’s The Planets, or Debussy’s “Sirènes.” Technical praise is lavished on the chorus, but the novelty of a seated textless chorus seems to be almost completely ignored. 1 David Hall, liner notes to A Song of the High Hills, by Frederick Delius. 2 Frederick Delius, Brigg Fair and Other Favorite Orchestra Works (New York: Dover, 1997), 146. 4 Andrew J. Boyle, “The Song of the High Hills,” Studia Musicologica Norvegica 8 (1982): 147. 5 Frederick Delius, Brigg Fair and Other Favorite Orchestra Works, 167. 8 Coates also conducted the first complete performance of Holst’s The Planets in 1920. 9 Alfred Kalisch, “London Concerts,” Musical Times 61 (1920): 247. 10 Harvey Grace [Feste, pseud. ], “Interludes,” Musical Times 61 (1920): 241. 11 W. McNaught, “Choral Notes and News,” Musical Times 61 (1920): 253.